After a long battle with renal disease, we’ve let Canada Lynx Cleo finally be free. There are so many reasons why wild animals shouldn’t be pets. So many stories we hear break our hearts. And some are still sad, even though they find their way to the sanctuary. But we know we gave them all we could for the time they were here, and that’s the most we can ever do. For most of her life, Cleo was kept as a pet in a household. And even though she was loved by her family, she never got to experience what being a lynx truly was. She was in her teen years before she was surrendered to the sanctuary due to a divorce. Experiencing grass under her feet for the first time should be exhilarating, but for her it was frightening. The interior of a house was all she knew. She’d imprinted on the humans that raised her and didn’t imprint again. She was declawed and had spinal arthritis from a past injury. She had chronic GI issues which would not allow her to eat a raw diet like the other wild cats at the sanctuary. Most cats transition in a very short time to their new wild life here. But Cleo put up a wall and wouldn’t let us in. So we watched Cleo from a closed circuit TV to make sure she was okay and adjusting to her life at the sanctuary. We loved her and hoped that she would realize just how special she was to us all. She was given a comforter and stuffed animal. We’d often find her curled up with both. After a few months, she’d run along the outdoor shared wall with geriatric bobcat, Salem. Sometimes for play, sometimes to assert her dominance. But even with the best medical care for her ailments, enrichment, indoor and outdoor areas, Cleo the lynx always appeared a little unsettled. A wild cat caught between two worlds was always an internal struggle for her. Now, she can finally be free. Cleo, we loved you more than you’ll ever know. We tried harder than you’ll ever understand. We’ve given you the last gift we possibly can, to finally live your forever wild life. We hope you enjoy your newly found peace. We will miss you! 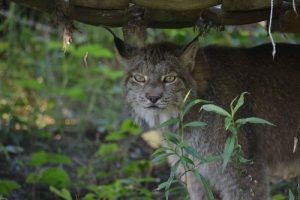 In March of 2015, we received a very familiar call – a private owner whose life circumstances were quickly changing and it would be impossible for him to keep the exotic cat he so loved. 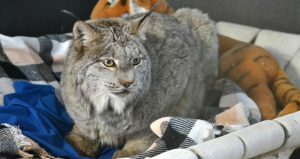 His Canada Lynx had spent all thirteen years of her life with he and his wife, living indoors as a household pet here in Minnesota. But, because of a divorce and a move to an apartment, it would be impossible for him to keep her. So, wanting to do the best for her, he contacted The Wildcat Sanctuary in hopes we could take her in. 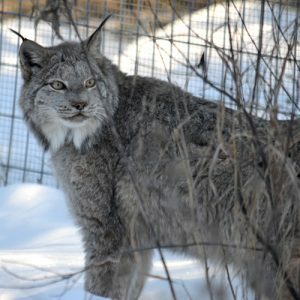 Cleo had never experienced the outdoors or all the things a Canada Lynx loves; grass to catnap in, pines trees to smell, and snow under those big, gigantic paws. Though she’s a wild cat by nature, she’d always been treated as a domestic cat by her owner. Naturally, once she arrived, her first days at the Sanctuary proved to be a big adjustment for her. Everything was so new and scary. The caretakers gave her plenty of tender loving care, helping her acclimate to her new life. Cleo had been fed a canned food for exotics her entire life. 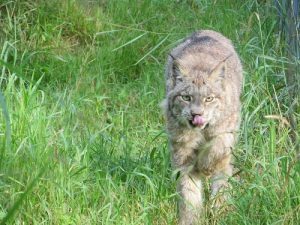 She never had the typical raw meat diet that Canada Lynx eat in the wild. It didn’t take long for her to begin enjoying her new chicken diet while getting used to the sights, sounds and new neighbors she began meeting at the Sanctuary. We’re thankful that our supporters donate so that we can provide cats like Cleo the chance they need to live out their lives the best way possible – wild at heart! Cleo had been 4-paw declawed by her previous owner. Declawing involves amputating the toes of a cat up to the first joint. It is not just removal of the claws. To declaw a cat, the veterinarian cuts off the last knuckles of a cat’s paw – cutting through bone, tendons, skin and nerves. In a person, it is equivalent to amputating each finger or toe at the last joint. 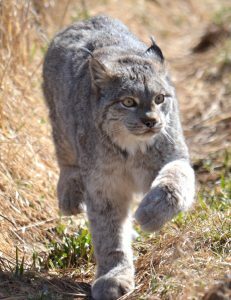 Sadly, almost 70% of the cats that come to The Wildcat Sanctuary have been 4-paw declawed before they arrive. Regrowth of bone and numerous bone fragments left under the skin can cause permanent lameness, excruciating pain, or arthritis. During Cleo’s intake exam, we found she has regrowth on 50% of her toes which will need to be monitored and repaired. We urge everyone to find out more about declawing HERE. Cleo’s made herself at home at The Wildcat Sanctuary.